Neem (Azadirachta indica) is a tree in the mahogany family Meliaceae. It is one of two species in the genus Azadirachta, and is native to India, Myanmar, Bangladesh, Sri Lanka, Malaysia and Pakistan, growing in tropical and semi-tropical regions. Other vernacular names include Neem (Hindi, Urdu and Bengali), Nimm (Punjabi), Arya Veppu (Malayalam), Azad Dirakht (Persian), Nimba (Sanskrit and Marathi), DogonYaro (in some Nigerian languages), Margosa, Neeb (Arabic), Nimtree, Vepu, Vempu, Vepa (Telugu), Bevu (Kannada), Kohomba (Sinhala), Vembu (Tamil), Tamar (Burmese), sầu đâu, xoan Ấn Độ (Vietnamese), Paraiso (Spanish), and Indian Lilac (English). In East Africa it is also known as Muarubaini (Swahili), which means the tree of the 40, as it is said to treat 40 different diseases. In India, the tree is variously known as "Sacred Tree," "Heal All," "Nature's Drugstore," "Village Pharmacy" and "Panacea for all diseases." Products made from neem tree have been used in India for over two millennia for their medicinal properties: Neem products have been observed to be anthelmintic, antifungal, antidiabetic, antibacterial, antiviral, contraceptive and sedative. Neem products are also used in selectively controlling pests in plants. It is considered a major component in Ayurvedic medicine and is particularly prescribed for skin disease. * All parts of the tree have medicinal properties (seeds, leaves, flowers and bark) and are used for preparing many different medical preparations. * Neem oil is used for preparing cosmetics (soap, shampoo, balms and creams, for example Margo soap), and is useful for skin care such as acne treatment, and keeping skin elasticity. Neem oil has been found to be an effective mosquito repellent. * Neem derivatives neutralise nearly 500 pests worldwide, including insects, mites, ticks, and nematodes, by affecting their behaviour and physiology. Neem does not normally kill pests right away, rather it repels them and affects their growth. As neem products are cheap and non-toxic to higher animals and most beneficial insects, they are well-suited for pest control in rural areas. * Besides its use in traditional Indian medicine the neem tree is of great importance for its anti-desertification properties and possibly as a good carbon dioxide sink. 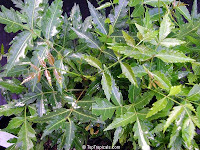 * Practitioners of traditional Indian medicine recommend that patients suffering from chicken pox sleep on neem leaves. * Neem gum is used as a bulking agent and for the preparation of special purpose food (for diabetics). * Aqueous extracts of neem leaves have demonstrated significant antidiabetic potential. * Traditionally, slender neem branches were chewed in order to clean one's teeth. Neem twigs are still collected and sold in markets for this use, and in India one often sees youngsters in the streets chewing on neem twigs. * A decoction prepared from neem roots is ingested to relieve fever in traditional Indian medicine. * Neem leaf paste is applied to the skin to treat acne. * Neem blossoms are used in Andhra Pradesh, Tamilnadu and Karnataka to prepare Ugadi pachhadi. Actually, "bevina hoovina gojju" (a type of curry prepared with neem blossoms) is common in Karnataka throughout the year. Dried blossoms are used when fresh blossoms are not available. In Tamilnadu, a rasam (veppam poo rasam) made with neem blossoms is a culinary speciality. * A mixture of neem flowers and bella (jaggery or unrefined brown sugar) is prepared and offered to friends and relatives, symbolic of sweet and bitter events in the upcoming new year. Extract of neem leaves is thought to be helpful as malaria prophylaxis despite the fact that no comprehensive clinical studies are yet available. In several cases, private initiatives in Senegal were successful in preventing malaria . However, major NGOs such as USAID are not supposed to use neem tree extracts unless the medical benefit has been proved with clinical studies. Neem is deemed very effective in the treatment of scabies, although only preliminary scientific proof, which still has to be corroborated, exists, and is recommended for those who are sensitive to permethrin, a known insecticide which might be an irritant. Also, the scabies mite has yet to become resistant to neem, so in persistent cases neem has been shown to be very effective. There is also anecdotal evidence of its effectiveness in treating infestations of head lice in humans. A tea made of boiled neem leaves, sometimes combined with other herbs such as ginger, can be ingested to fight intestinal worms. The oil is also used in sprays against fleas for cats and dogs.